Take a break from the city and head to Bosque de Chapultepec and The Muddy Boot. Get some historical perspective at Historic Center (Centro Historico) and Zona Arqueologica Teotihuacan. Venture out of the city with trips to Zoofari (in Amacuzac), Paso de Cortes (in Amecameca) and Toluca (Nevado de Toluca / Xinantecatl, La Miniatura, & more). Spend the 11th (Sun) exploring nature at Cumbres Del Ajusco National Park. Spend the 1st (Thu) exploring nature at Mirador Pena del Cuervo. 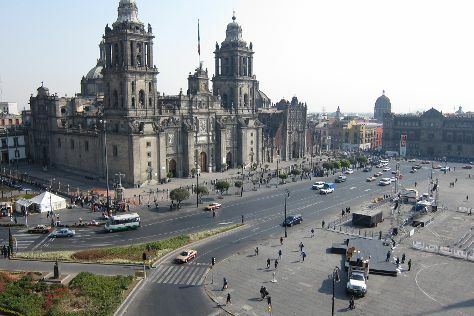 The adventure continues: contemplate the long history of Metropolitan Cathedral (Catedral Metropolitana), admire the masterpieces at Palacio de Bellas Artes, appreciate the extensive heritage of Zocalo, and see the interesting displays at National Museum of Anthropology (Museo Nacional de Antropologia). If you are flying in from United States, the closest major airports are Licenciado Benito Juarez International Airport, Querétaro Intercontinental Airport and General Francisco J. Mujica International Airport. In November, daytime highs in Mexico City are 72°F, while nighttime lows are 49°F. Finish your sightseeing early on the 30th (Fri) so you can travel back home.